Finding Something Friday: Contests! Book Giveaway! Cathy-on-a-Stick! First up, take a look at Writer’s Journal Romance Contest here. Back in the day, I sent a story in to Write To Win!, an ongoing prompt contest. I didn’t win, and of course, I had that typical wet-writer-behind-the-ears reaction. I could not believe that some judge would pass up the awesomeness of Cathy C. Hall’s stories. Ahem. Looking at one of those stories recently made me cringe. Cringe. Since then, I’ve had a chance to re-assess the Cathy C. Hall writing awesomeness and adjust accordingly. So, maybe I’ll try Writer’s Journal again. Maybe not the romance contest (deadline July 30th), but there’s always some contest going on there (see the Contest Calendar here). Now, if romance isn’t your thing, you can check out the White County Creative Writers contests, ’cause there’s a mess of writing contests to try. I have a favorite children’s story to send, but honestly, the fees are so reasonable, I might send a mystery, too. Or a Love Bytes poem (not that loves bites around here, she said, as the beneficent Mr. Hall walked by). And thanks to Donna at the Book Pub for g iving me the heads up about this contest. What else? Oh, yes! 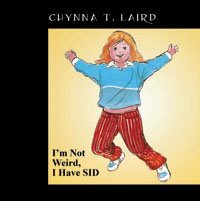 Chynna Laird’s I’m Not Weird, I Have SPD, is over at Finders & Keepers today for Peek-a-Book. She shared some great writing tips for getting into the world of a child, especially when that child has a special need. And she published through POD, and gives tips about that experience. So if you have questions for Chynna, or would like to win her book for someone special you know, drop in and leave a comment. You might want to drop in on Cathy-on-a-Stick sometime today, too, for her latest shenanigans. You know, I should enter her in a contest. Best Pic-on-a-Stick, anyone? What fabulous links! Thank you! I didn't even realize you had two blogs!!! Busy!